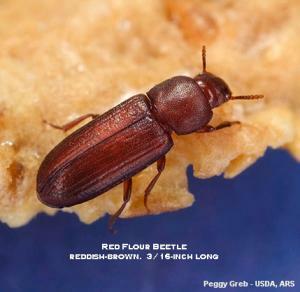 The red flour beetle (similarly to the closely related confused flour beetle) is a common household insect pest that originates from infested grain or from dry, stored food products, particularly, cereal products such as flour, cake mix, cornmeal, crackers, dry pet food, and so forth. Other frequently-infested items are chocolate, nuts and seeds (such as bird seed). Both adults and small, off-white larvae will be found in an infested food item. The adult beetles often wander away from the infested material and will be found inside cupboards or anywhere in the house. Insecticide sprays are not recommended for controlling insects in stored food cupboards. Washing shelves with detergent, bleach, ammonia or disinfectants will not have any effect on insect pests. As a precaution against reinfestation, you may want to store susceptible foods in sealable glass, metal or heavy plastic containers or in the refrigerator or freezer until you are convinced the infestation is gone.